Throughout my time I have taken in many pets. Whether they have short, medium, or long hair, they ALL seem to shed. Sometimes I even think my shorter haired pets shed more than my longer haired ones. With all the hair types I have encountered it is to no surprise that I have tried my fair share of brushes. There are only two brushes that I have tried thus far that I will recommend, and I will tell you about one of those today. Brushing can be a frustrating process for most pet owners, especially if your furry friend hates being brushed. As I was searching around one day, I came across the Safari Self-Cleaning Slicker Cat Brush. Intrigued by the name, I decided to give it a go. Here is a picture of the Safari Self-Cleaning Slicker Cat Brush. I immediately fell in love with this brush after using it for the first time. Not only did it remove all of the dead hair, but it left their coats nice and shiny, and the brushing "experience" was enjoyed all, even those who typically hated to be brushed. One of the best features on this brush is its self-cleaning abilities. When you have finished brushing your pet you take the brush over to the trash. As you can see in the picture above and below, there is a button on the back that you can press. Once you press this button the teeth retract back causing the hair to fall off in the trash very easily. This wonderful feature makes cleaning the hair off of the brush an effortless process. Below is a picture of the Safari Self-Cleaning Slicker Brush for Dogs. 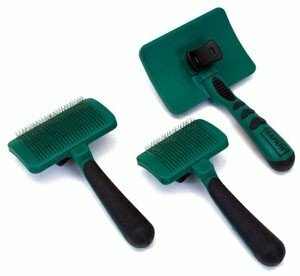 I recommend these brushes to anyone who owns a dog or cat. You can't go wrong with this purchase. Now is a great time to purchase these brushes as well. With the holidays coming up, most of us will have family and friends coming over, and you probably won't want pet hair floating around your home. This brush will help keep pet hair in the trash, and not all over your furniture and clothing. 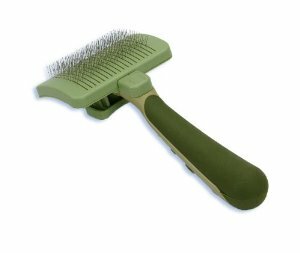 Click Here for more info on the Safari Self-Cleaning Slicker Brush For Cats. Click Here for more info on the Safari Self-Cleaning Slicker Brush For Dogs.